The Luberon, region of Provence is known for its rows of blue lavender in spring. We had the opportunity to visit the Luberon with the children during holiday : the region is attractive and colorful. during our family week in the Luberon, we went to discover the perched villages overcome of their castle or church. We enjoyed strolling through the cobbled streets, appreciate the old stone buildings full of ivy. We discovered the beautiful ochers of Roussillon and Rustrel rightly nicknamed the Provençal Colorado. We also had the opportunity to make some colorful walks in the natural park of Luberon. Discover the famous perched villages. Oppède-le-Vieux, a medieval village in the Luberon : Oppède-le-Vieux is a small medieval village in the Luberon perched at 300 meters altitude. You can ride on the high and hike in the ruins of a castle. It offers also a panoramic view of the Luberon. You can also visit the landscaped garden of the Old Oppède which extend at the foot of the village. We can discover a dozen terraces where grow more than 80 species of hardy, herbaceous plants, shrubs and trees of the Luberon. Our travelers could sniff some provencal herbs as rosemary or sage. Bonnieux, the Mount Saint Michel of the Luberon : The village of Bonnieux is nicknamed the Mount Saint Michel of the Luberon because of the church that overhangs the village. We fall in love with its old streets lined with stone houses. Along the doors and the green or turquoise shutters run reddish tentacles of the vine. We have the feeling of being out of time. Our travelers were very amused by the small door cut for Hobbits. Following a lane, we reach the foot of the church guarded by gigantic cedars, with huge outstretched arms. We climb to the ramparts which offer a large panorama on the Luberon. A viewpoint allows us to identify the surroundings,Gordes and Lacoste. On clear days, you can even see the white nose tip of the Mount Ventoux. Gordes, Luberon Provençal pyramid : After the provencal Mount Saint Michel, we discover the Provence Pyramid of the Luberon : Gordes, built on the heights, peak rises towards the sky. This time it is a castle that crowns the top. The stone houses weathered by time cling to the steep side of a rock outcrop. We won't tire of strolling through the cobbled streets which resonate underfoot. We made many breaks to enjoy the view of the valley and the Luberon mountains. Oppedette, a wild landscape in the Luberon: Finally the last Luberon village that we had the opportunity to visit, Oppedette. This perched village seems to have arisen from the rock. 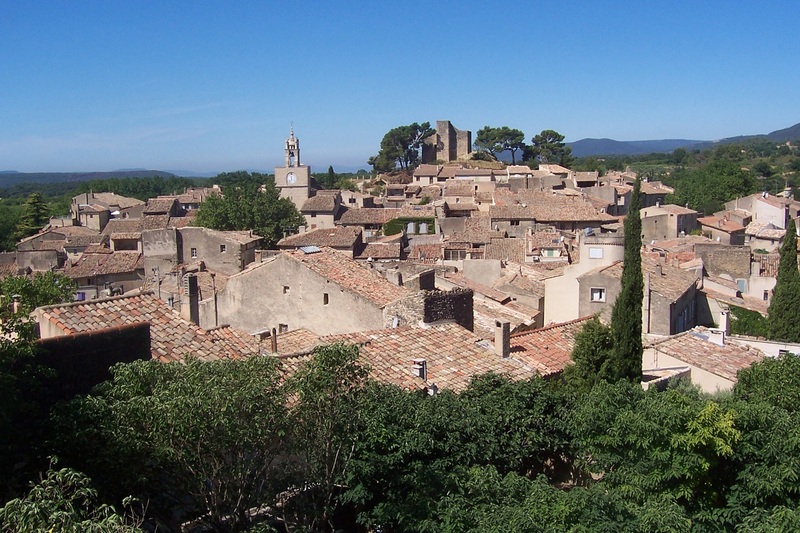 It is a very peaceful Luberon village with only 40 inhabitants. We especially see cats, perched on columns or walls. By a path, we reach the top of the village. There are no ruined castles, no old churches. Just a vast esplanade ! As soon as we approach the side : we plunge ! The village overlooks a gorge carved by the river of Cavalon. This is the Oppedette canyon, deep from 100 to 150m.